It was an awesome Resurrection Sunday! We had a cardboard testimony in Church and I am so blessed to read it all. God indeed is on the move in the lives of our people. He gives hope and life everlasting to all. It was a great privileged as well to share that hope to our neighbour. They moved few months ago, an indian couple from Bombay with three children, same age as my kids. I baked cookies for them to welcome them in our neighbourhood and even hubby snow blow their pathway as they did not have anything to use for winter and obviously not ready for a lot of snow :) They are very shy but nice family. The other day, someone knocked on our door. It was Tamia, our neighbour and she handed me a what she said an special indian traditional dessert. She is so sweet, she even explained to me how to eat it. 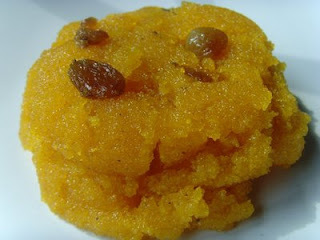 She call it Suji Halwa, an indian Semolina Raisin Pudding. It was so good! Help me pray with this neighbour. It's a great privilege to have that rare opportunity to share the One True God to those who are really seeking. I pray that God will bring us to those people or He will make a way for us to meet them. God bless!